(Logan, UT – January 15, 2019) — Altra’s Lone Peak trail shoe was named “The Top Footwear on the Appalachian Trail” for 2018 by The Trek. Altra was also awarded the “Most Popular Shoe Brand” and the “Most Popular Shoe” for the Lone Peak on Halfway Anywhere’s Annual Pacific Crest Trail Thru-Hiker Survey. The Lone Peak is the shoe of choice for Altra Elite hiker Heather “Anish” Anderson, who set the world record as the first woman to complete the Triple Crown of Hiking in a single year. The Triple Crown consists of three thru-hikes: the Pacific Crest Trail, the Appalachian Trail and the Continental Divide Trail. This record also made Anderson the first female Triple Triple Crowner, meaning she completed each trail three times. Altra hikers Ras and Kathy Vaughan of UltraPedestrian wear the Lone Peak to pioneer new thru-hikes, including the UP North Loop in 2018, as recently profiled in Outside magazine. The couple also completed a non-resupplied Mount Rainier to Mount Adams to Mount Saint Helens Traverse in 2017, the Mount Rainier Infinity Loop and Mount Adams Infinity Loop in 2016, a yoyo route of the Arizona National Scenic Trail in 2015 and the Triple Crown. The Lone Peak is Altra’s best-selling trail shoe and is now available in four different styles: low and mid height with either mesh or RSM (rain, snow, mud) waterproof uppers. Thru-hikers have made the Lone Peak trail shoes more popular than traditional hiking boots because of their minimal weight and the brand’s signature FootShape™ toe box and Zero Drop™ platform. The Trek posts an annual online thru-hiker gear survey for the Appalachian Trail, the Pacific Crest Trail and the Continental Divide Trail. Their survey breaks down the most popular gear on each trail, and for the first time ever, the Lone Peak won the top footwear spot on the Appalachian Trail. Halfway Anywhere surveyed nearly 500 Pacific Crest Trail finishers to assess the top gear choices, providing the results as a resource for future PCT hikers. From the surveys collected, Altra and the Altra Lone Peak topped the list of favorite gear. 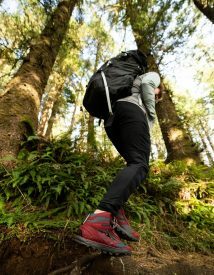 Check out Altra’s selection of Lone Peak trail shoes at www.AltraRunning.com or at your local specialty running retailer.